Companies rely upon the concepts of business process management to improve efficiency and services in their delivery processes and methods. With the focus and interest in supply chain management, the boundaries for BPM have expanded from internal processes within a company to external processes encompassing a company's supply chain partners. From this perspective, the need for professionals and current students to understand the concepts of BPM has never been higher. In addition, while the manufacturing sector was the place where the initial BPM implementations occurred, other sectors have, over time, progressed to a better understanding of the same needs for more efficient business processes in their respective business environments including service sector organizations. 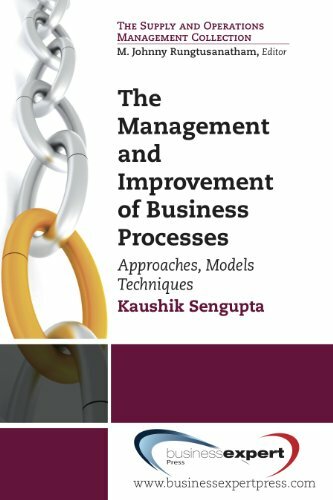 This title considers this multi-sector requirement for a better understanding of the concepts in business process improvement by providing tools and techniques required for successful implementation. It argues that the techniques of BPM are applicable to a variety of types of organizations and business enterprises. The presentation is primarily qualitative but quantitative tools are a necessary part of BPM and they are introduced as needed in the discussion. The book presumes a basic understanding of these tools on the part of readers; for readers needing review of these concepts an appendix is provided in the book.